The National Trust's newest National Treasure, Nina Simone's childhood home, is one of the few existing places tied to the musician and activist before she became famous for her diverse repertoire and strong belief in civil rights. 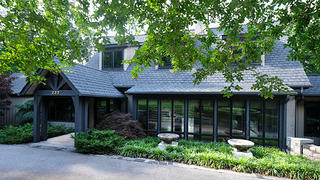 In 2017, four artists—Adam Pendleton, Rashid Johnson, Ellen Gallagher, and Julie Mehretu—purchased the house in Tryon, North Carolina, and will be working with the National Trust and other partners to preserve this part of Simone's early life and bring her international legacy back home, to where she was known as Eunice Kathleen Waymon, daughter to a Methodist minister and the owner of a dry cleaning business. 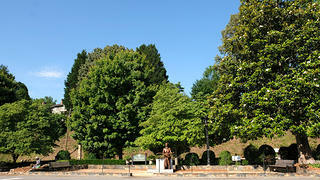 Raised in the small clapboard house in Tryon, North Carolina, Waymon began playing the piano informally as a toddler. Her parents and the community recognized her obvious talent, and she was soon performing in church and taking proper lessons with a local teacher. By 1954, after studying briefly at the Julliard, a young Eunice Waymon was a piano teacher herself, giving lessons in Philadelphia. After learning from some of her students that they had earned lucrative summer jobs playing in Atlantic City (which was then segregated), Waymon was hired at the Midtown Bar and Grill on Pacific Avenue. 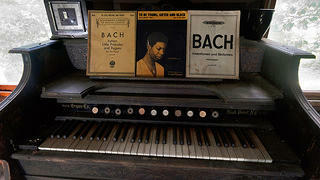 She had never played in a bar before, and, worried that her mother would be displeased, changed her name to Nina Simone. It was an average bar, unassuming, and after playing the piano a few hours, Simone's boss informed her she needed to sing. 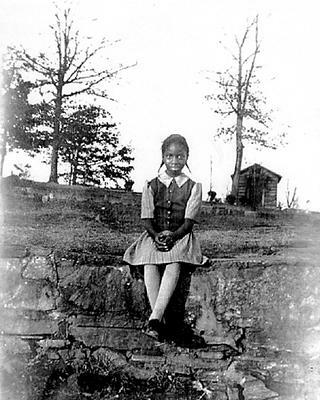 A young Nina Simone (then Eunice Waymon), age 8. Waymon had grown up singing biblical tunes, but racial unrest throughout the country affected her deeply, and her later performances reflect both her anger and fearlessness. Through the 1950s and into the '60s, Simone cultivated her musical style, which combined jazz and blues and classical undertones. She performed in places like the popular Village Gate in Greenwich Village; Carnegie Hall, where she gave her first solo concert in 1963; Detroit in 1967, two weeks after a devastating riot; Harlem in 1969; and even on the tenement stoop of the Sesame Street set. Simone's personality, tinted by her experiences with racial injustice and personal troubles, was larger than life. She passed away in 2003, but her songs have experienced a recent resurgence. Musicians continue to cover her popular hits, and now, thanks to the dedication of four artists, the preservation of her home in Tryon will preserve her legacy from its beginning. 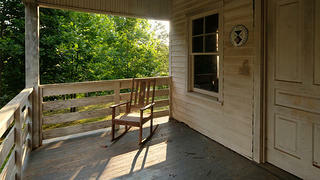 Built near the Blue Ridge Mountains and just a half mile from downtown Tryon, this circa-1928 frame house is where Simone grew up with her seven siblings and her parents. 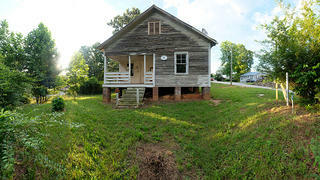 The house is just a few of its kind in this part of Tryon, which was largely African American. 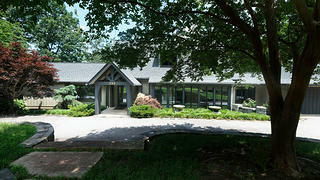 A man who understood Simone's legacy saved it from demolition in 2005, but had to place it on the market in 2016. Luckily, in 2017, four artists purchased the house with the goal of preserving this important part of Simone's life. 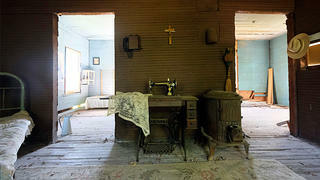 The organ currently inside the house is similar to the pump organ Simone began practicing on as a toddler. She gave her first recital at age 10. At the recital, her parents were asked to give up their front row seats to a white family. Simone refused to play until her parents could return to their seats. Simone began taking piano lessons with Muriel Mazzanovich at her house two miles down the road. Simone's mother worked part-time for a woman who funded Simone's lessons with Mazzanovich. 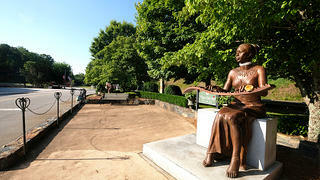 The Nina Simone Project commissioned sculptor Zenos Frudakis to construct this bronze statue. 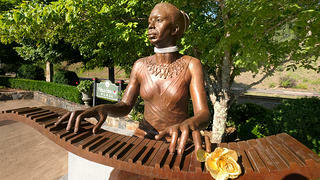 It was placed in Tryon's Nina Simone Plaza. Simone's daughter, Lisa Simone Kelly, posed for Frudakis. The plaza was dedicated in 2010. Inside the statue is a bronze heart that includes Simone's ashes. The National Trust has put together two preservation-themed playlists on our Spotify channel, which includes songs by Nina Simone and other influential artists.